An uproar erupted on social media after photographs appeared to show workers removing a graffiti wall in downtown Cairo. While Aswat Masriya reported that the removal of the graffiti is part of a greater move to ‘beautify Tahrir Square’, journalists on the ground have revealed that this is not true. “In the framework of beautifying Tahrir Sqaure, the Egyptian government asked the American University in Cairo to either develop or remove its Science building along with its walls on Mohamed Mahmoud street,” Rehab Saad, Director of Media Relations at the American University in Cairo, told Aswat Masriya in a report that seemed to substantiate claims the Egyptian government is moving to remove graffiti. “The university decided to demolish the walls and replace them by an iron gate,” added Rehab Saad. 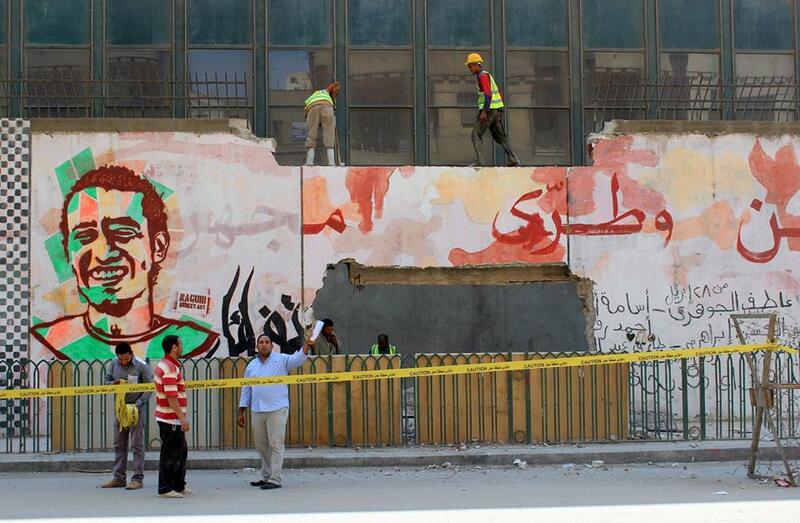 However, journalist Basil El-Dabh revealed that only a section of the wall at Mohamed Mahmoud has been demolished. “They are not tearing down the entire wall,” tweeted El-Dabh. These tweets were supported by Ester Meerman who spoke to some of the workers. Those workers were pretty confused as to why so many ppl were taking pictures of them doing their job, btw. Friendly guys. Despite reports confirming that only this part of the wall is intended to be demolished, social media users expressed their outrage at the ‘erasing’ of Egypt’s revolution. “There is nothing left from the battle of Mohamed Mahmoud than what is currently being removed,” posted one user on Facebook. Meanwhile, Dalia Ezzat, Editorial Director of the Tahrir Institute, tweeted that the move harms Egyptians’ collective memory of the revolution. “Destroying monuments through which our collective memory of the revolution survived,” tweeted Ezzat. Located on Mohamed Mahmoud street, which connects to Tahrir Square, the graffiti has represented various stages of the Egyptian uprising since 25 January 2011. After the January 25 revolution, graffiti continued to feature prominently in downtown Cairo, mirroring the alterations in the political scene.